Nickname: "Father of His Country"
Birth Order: First of six full siblings. Sixth of eleven full and half-siblings. The Judiciary Act specified the number of Federal courts and judges. Supreme Court met for the first time with John Jay as the Chief Justice. Federal capital established in swamplands on the Potomac. A national banking system established by the Bank Act. The Bill of Rights take effect. Post Office established by Congress as a separate entity. New York Stock Exchange organized. Coins are minted by the government as enacted by the Coinage Act. War breaks out between Britain and France. On April 22, U.S. declares neutrality. Whiskey Rebellion over excise tax in western Pennsylvania. Federal troops called to suppress the armed rebellion. The Jay Treaty ratified. British troops required to withdraw from the U.S.
Pinckney's Treaty with Spain opened navigation on Mississippi River. Washington posed for Stuart's portrait, which is now on the one dollar bill. 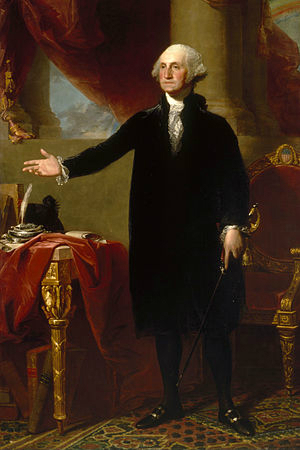 Washington delivered his Farewell Address. Comprehensive biography written by Historian Allan Nevins and Professor Emeritus Henry Graff. Includes additional media. 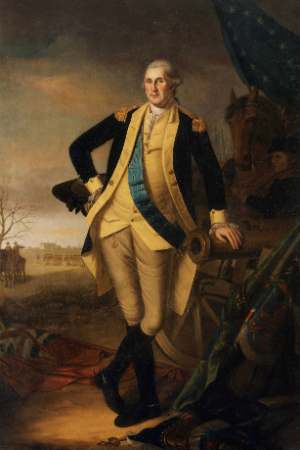 Very interesting examination of George Washington's elevation to divine status through history. Text copied from National Archives and Records Administration The Founding Fathers' Page as part of a larger hypertext on American history. Not just a biography, this site includes information about his thoughts on slavery and religion, farming, his famous quotes, and even his dentures. Published eight years after Washington's death, this volume covers Washington's life in thirteen chapters. D.E. Vitale is the archivist in charge of this project. Richard Norton Smith's article from the Quarterly of the National Archives (Spring 1994, vol. 26, no. 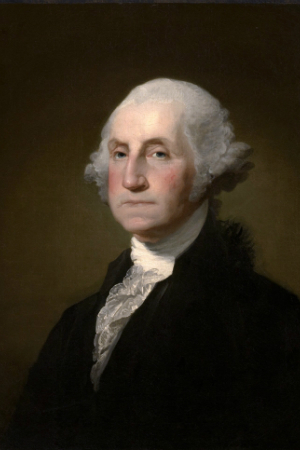 1) examines Washington's characteristics and his treatment as a historical figure. More than a typical biography. Also includes links to some images. Biography covering Col. Washington's time at Fort Edwards (1748-1758). Includes text of Washington's account of the Battle of Fort Necessity. This resource, collected by the University of Virginia and the Mount Vernon Ladies Association, contains historical context to some of the documents and letters written by Washington. Unfortunately, most of the text of these documents are not online. This parkway preserves the scenery along the Potomac River, from Mount Vernon, through the nation's capital, to Great Falls on the Potomac. From the National Parks Service. Washington's home from the age of six until his early thirties. Located in Stafford County, Virginia. "The Moland House - George Washington's headquarters on August 10, 1777, where the Marquis de Lafayette joined the American Revolution, the American Flag was said to have first flown over American troops here, and several other historic generals joined the American Revolution." Located in Warwick Township, Pennsylvania, the history and fight for preservation of this site are explained. Located in the Black Hills of South Dakota, the faces of Washington, Jefferson, Lincoln and Teddy Roosevelt stand 60 feet tall. From the National Parks Service. A complete guide to Washington's Virginia plantation. The Sulgrave, England ancestral home of the Washington family. Family history and tour information available. History, nature, educational resources, and vistor information. From the National Parks Service. Quick facts, history and a tour of this landmark from the National Park Service. Tourist information about this 538 acre National Park can be found from the National Park Service. Believing that shaking hands was beneath a president, Washington bowed to his visitors. Washington has the distinction of being the only president to be elected unanimously by the electoral college. 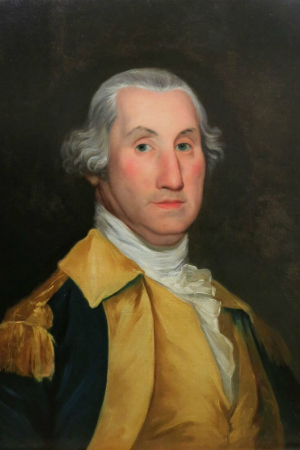 Washington had one remaining tooth at the time of his inauguration. During his lifetime he wore dentures made of human (some his own), cow, or hippopotamus teeth, ivory, or lead, but he never wore wooden teeth. Many places are named after Washington including the nation's capital, the state, 31 counties and 17 communities. The six white horses in Washington's stables had their teeth brushed every morning on Washington's orders. The nation's capital was located in Philadelphia during Washington's administration making him the only president who didn't live in Washington, D.C. during his presidency. 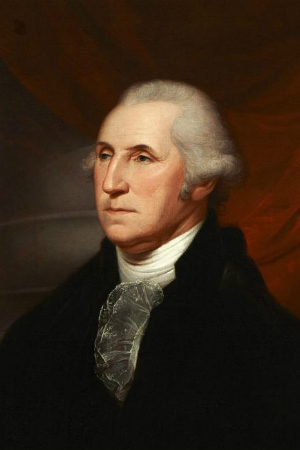 Washington was the first president to have his likeness on a coin and a stamp. On his only trip outside of the country, Washington contracted smallpox while in Barbados. He was able to recover while also building an immunity to future exposure. Washington's second inaugural address was the shortest ever delivered - it took less than two minutes to recite the 135 words.